The Kershaw DuoJet offers you the dual benefits of great style and a value price. This eye-catching EDC has a wide clip-point blade of quality 8Cr13MoV stainless steel with gray titanium carbo-nitride coating. The durable coating provides an extra measure of corrosion protection. The steel handle has matching gray titanium carbo-nitride coating and dual carbon fiber inserts. 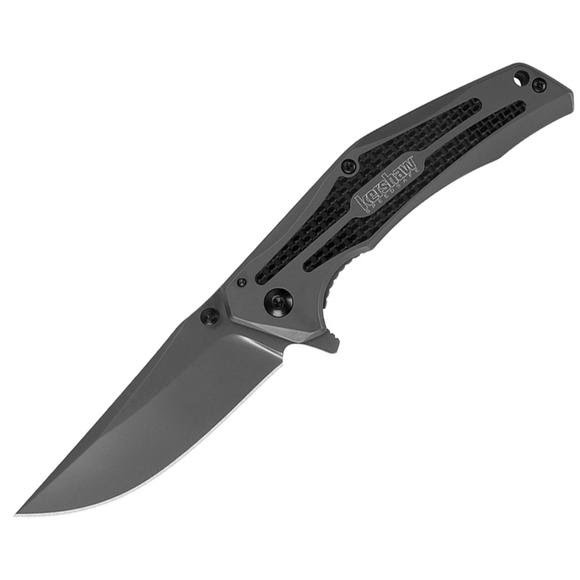 The Kershaw DuoJet offers you the dual benefits of great style and a value price. This eye-catching EDC has a wide clip-point blade of quality 8Cr13MoV stainless steel with gray titanium carbo-nitride coating. The durable coating provides an extra measure of corrosion protection. The steel handle has matching gray titanium carbo-nitride coating and dual carbon fiber inserts. The matte gray coating contrasts handsomely with the carbon fiber especially when light is reflected in the two inserts. The DuoJet locks safely open during use thanks to a sturdy frame lock. The handle is contoured for comfort and secure grip. The DuoJet opens quickly and easily with SpeedSafe® assisted opening using either the built-in flipper or the thumb stud. The knife&apos;s hardware is black to match the carbon fiber, including the single-position deep-carry pocketclip. The DuoJet also includes a lanyard hole so you can customize it with your favorite paracord lanyard. With all this style, the DuoJet is easy to like and comes in at a price that&apos;s easy on the wallet, too.